This is a delicious berry salad that can be adapted to suit your taste. My favorite way is to use it to top my Vanilla Texas-Blondies. Ever since my sister started doing her clean eating diet, only just 8 days ago, every time I eat something I think to myself, "could Ann eat this?" or "how could this be made so she could eat this?" Okay, yeah, I bought tons of berries. I love to eat fresh fruit, but after a couple bowls of plan fruit, the taste can get kind of boring. I decided to kick them up a notch, and decided to try a simple glaze to mix the fruit in. I did add flaked coconut, which has been sweetened, so if you are on a clean eating diet like she is, don't add that. But I love coconut, and it added a different texture to the berries (and banana I added also). My fruit measurements aren't exact, but you get the idea. Depending on how much fruit you use, the honey and lime ratios could be varied as well. You get the idea! *If using for a topping on the Vanilla Texas-Blondies, leave out the banana and coconut, if you wish. I like to let the fruit sit over night to get juicy and really mesh together. 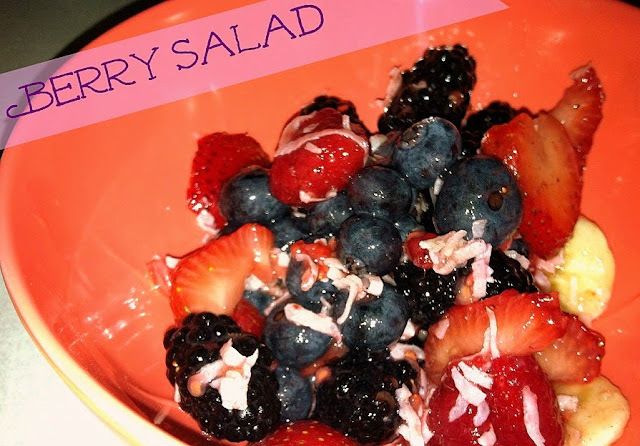 Combine the berries, banana, and coconut to a large bowl. Add the lime juice and drizzle the honey over the fruit. Using a spatula or wooden spoon, gently mix the fruit.